At BlackBerry HQ in Waterloo yesterday, I sat down with Research In Motion CEO Thorsten Heins, and the company's newly appointed CMO, Frank Boulben. We covered a lot of topics, including the ramifications of BlackBerry 10 launching in the first quarter of 2013 vs. the previous target of Q4 2012. The CrackBerry community, myself included, has not been very forgiving to RIM on this delay since word of it came out via the company's recent earnings announcement. After speaking to both Thorsten and Frank, I have a much clearer understanding of why the decision was made to wait. Not only do I understand it now, but I get it. From a product quality, marketing and carrier support standpoint, it actually makes a lot of sense. Of course, that won't make waiting for BlackBerry 10 any easier. Heins understands just how frustrated we are with the delays and made it clear that he wasn't happy about the having to change the timeline either, but he simply won't allow RIM to ship anything that is less than 100 percent. That probably wouldn't have happened under the old guard. "Don't get me wrong," Heins told me. "I'd have loved to stick to that schedule, and I could have, if I would have sacrificed quality for it. We're not going to put product out there that isn't ready. We're done with that. That's over. This is not what we will be doing. So we gave the team the time to get it done and do it properly." The primary concern over maintaining quality was squarely focused on maintaining platform stability while integrating new blocks of code into the main "trunk." Basically, RIM locked down the features it wanted in BlackBerry 10 for launch, and the software group went to work in teams to tackle it. The individual teams were very successful at getting their individual pieces built, but when it came time to drop all the new code into the main codebase, they found things were a bit messy (some inconsistency in the way APIs were being introduced between different software teams, etc.). At that point they made the decision to halt the process and clean things up to ensure all future code drops would go more smoothly. Heins says the real cost of this process is a 6 - 8 week shift on the timeline of launching the full-touch BlackBerry 10 phone. As I hypothesized in a previous editorial, Heins also confirmed the delay in the launch of the full touch phone doesn't impact the timeline of the qwerty version, so the lag between the two devices being launched will be reduced from what was originally planned. As for when, Heins is confident Q1 2013 will not slip. "I'm very confident about the first quarter, whether it's January or February," Heins told me. "You'll see lab entry and technical acceptance already kicking in, in Q4. Just the ramp up and launch with carriers will happen in Q1." One of the primary concerns expressed by myself and the CrackBerry community over the delay to 2013 was that RIM will miss out on important holiday sales. Heins acknowledged this as the major detriment to the delay and noted that him and Boulben had intense discussions around this subject. The consensus was that even without the delay to 2013, getting into stores late in Q4 may have proved to be less than ideal. Boulben, the chief marketing officer, echoed that sentiment. "The carriers want to take full advantage of Q4," Boulben told me. "So if you want to have a real push from the carrier you need to be there in September / October. Then you have the marketing money, the share of voice and the staff would have been trained in September. If you are going to come to market in the second half of November or beginning of December, you won't get the full efficiency of the marketing of the carrier." Heins said they actually refer to this late November/December period at RIM as "No Man's Land," and, he continued, "you never want to launch during 'No Man's Land.' "
Boulben added that some carriers reached out to him directly and advised him that RIM should target a January launch for BlackBerry 10 to which Heins made note, "It actually gives us more focus and attention in Q1." Why Launch a Full Touch BlackBerry phone before the QWERTY model? With the talk of delays out of the way, I shifted my focus to another question that comes up on CrackBerry a lot. Why launch the full touch BlackBerry 10 phone first? 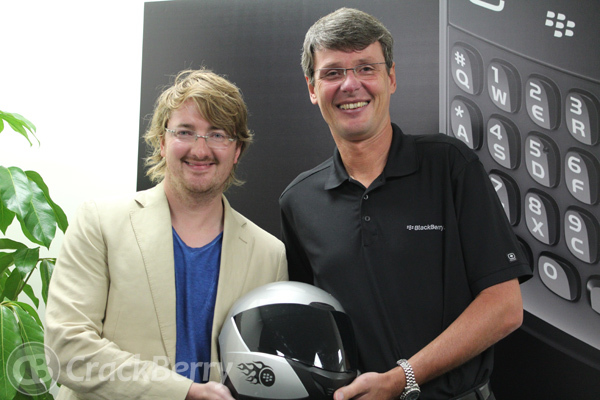 I have my theory on it, so wanted to hear the real answer straight from the BlackBerry CEO himself. "There's two reasons for this. The first reason, without being arrogant, I think we own the full qwerty market. The Bold 9900 is doing a good job of this in the market with our corporate customers. In the US we're most under pressure with the BYOD movement in enterprises, so we need to get in the battle. That's why we need the entry card, which is the full touch device, so we can go to enterprises and say, hey look at this, this is the full touch from BlackBerry and it does things way better than what you have today. And I think it's going to be way better. And then the qwerty comes immediately thereafter." "The second reason is technology. Building the full touch device on this platform is more complicated than the qwerty one. So it's natural that you make the more complex product first that actually clears the pipeline for the platform." Another benefit of moving the launch of BlackBerry 10 to Q1 2013 is that it gives more time for RIM's new CMO to get the marketing plan together. That said, only four weeks into the role it's clear that Boulben has hit the ground running. 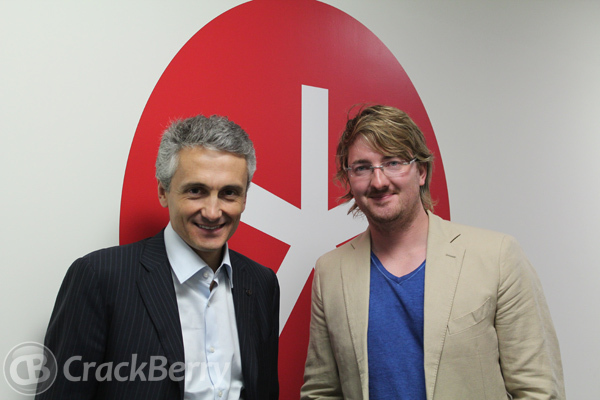 "Frank has a great marketing plan together for BlackBerry 10. Frank presented it to the board and the management team and they were really excited by it. It's really the first integrated, focused marketing campaign that RIM has done. I'm really looking forward to this. I think the world is going to be surprised by how well we execute. Not just on the product but also on the marketing side of it." "We will announce them together and not in sequence. We'll just come out and say full touch available at (this date) and full QWERTY available at (this date)." I couldn't help but let out a big grin at this news. It just makes so much sense. We've seen a lot of misreporting in recent weeks that RIM would be abandoning having a physical keyboard with BlackBerry 10. Those who follow the BlackBerry beat know this isn't true, but the average consumer is not as informed. Announcing BlackBerry 10 with a full touchscreen and qwerty version together ensures there will be absolutely no confusion in the market place. As marketing ramps up from day one, everybody will know BlackBerry 10 is available in both full touch and physical keyboard flavors. They'll be announced the same time, and the marketing efforts will benefit both devices. And it's clear that RIM will want the world to know they have the best typing experience on both qwerty and touch phones. And maybe the best part is that RIM is targeting a global co-ordinated launch effort here and the carriers are on side. "The carriers are with us," Heins told me. "All these things with the carriers are progressing: launch windows, launch plans, and Frank is all over this with the sales force. We have that support. The carriers want this platform out there. They see the Samsung / Apple duopoly and they don't like it. They want another third force. They believe we can do this. They've seen BlackBerry 10. They've had their hands around it. They can see it. And I think they like what they see. So that's on track." Full Touch or QWERTY... That is the Question! Knowing BlackBerry 10 phones will be announced together and that the full touch and qwerty versions will launch in quick succession, the question for upcoming BlackBerry 10 owners now becomes, full touch or qwerty? It's a tough call. Go for the screen real estate? Or go for those buttery smooth buttons a la the Bold 9900? I guess with BlackBerry 10 six months away we'll have plenty of time to contemplate this one. Or better yet, use the time to save up and just buy both.